While 6 mil vapor barriers are not as commonly used as the 12 mil vapor barrier and 20 mil vapor barrier, they still can be used in the crawl space. While we don’t personally recommend the 6 mil liner for crawl space floors, there’s no reason why 6 mil vapor barriers can’t be used on foundation walls. With a smaller crawl space vapor barrier, it’s very important to note that it’s extremely important to have a quality 6 mil liner and not a cheap wanna-be version that can leave you with more harm than good. There’s not much difference between 6 mil liners and 8 mil liners, two of the smaller crawl space vapor barrier sizes. nothing wrong with that. It all depends on your crawl space and exactly what’s going on. There’s a fair share of 6 mil crawl space vapor barriers on the market. If you’re new to the site, we’ve been encapsulating crawl spaces for decades. So over this time, we have dealt with many 6 mil liners over the years. One of the highest recommended 6 mil vapor barriers is the 6 mil DiamondBack vapor barrier offered by CrawlSpaceVaporBarrier.net. 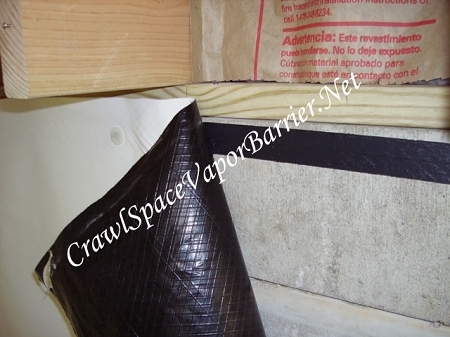 Crawl Space Vapor Barrier dot net is one of the most reputable crawl space industry platforms on the internet. Here’s some of the specs and details on their 6 mil crawl space liner. It is a nominal 8 Mil product which means it is not actual thickness at the plastic, its measured at the string just like ALL the other 6 Mil liners on the market today. We’ve learned that the 6 mil liner is great for encapsulating walls and piers. Again, rarely do we use 6 mil liners on the floor. Even with no storage on the vapor barrier, it would be best to use a 12 mil vapor barrier at the least.